I’ve been meaning to write about last Shabbat (and the previous one…whoops), but I’ve had trouble coming up with something because I don’t want to repeat things from my previous Shabbat posts. Rather than come up with a listing of my Shabbat activities, I thought I’d write about what it feels like to really experience the holiday here. My preparations start midday Friday and have evolved into a multi-hour long meditative process of preparing myself for Shabbat. I do laundry and tidy up my room as the afternoon sun pours through the windows. I walk across the street to the shuk to get groceries for the weekend, taking in the Friday afternoon commotion. The shops are packed with people trying to get their last minute items before everything shuts down. The usual smell of cigarettes and cat urine is covered up by fresh baked bread and chocolate rugelach. The shopkeepers call out their prices in a shout even louder than usual. I find a cheap clothing store and get a new dress to wear to shul. Shabbat here is communal-everyone celebrates in their own way, but the entire city shares a common sense of urgency to get home and get things done before the sunlight goes out. That’s what I really love about Shabbat here-I know that everyone around me is preparing to sit around the table and enjoy their day of rest. Late Friday afternoon is my favorite time of the whole week. I come home from shopping and paint my nails, humming the songs I’ll hear at night in the synagogue. My ‘Shabbos Shower’ allows me to transition from the stress and long days of the week into Shabbat. I scrub off all the dirt and sweat of the week (I do shower during the week, I just get extra clean on Friday) and use my most favorite rose jam soap. After showering, I feel that my mind has also been cleansed and I am at my most peaceful. As I slip on my new dress, I say shehecheyanu, the blessing said the first time one does or uses something. I tie up my hair into a tight braid, just like the braided challah I’ll eat later tonight. My final preparation is to fasten my kippah to my head. 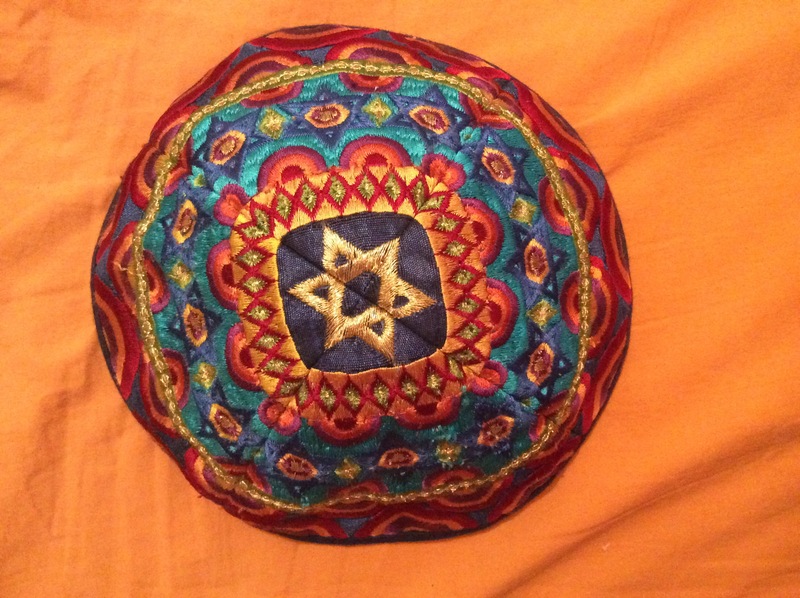 I have a kippah that I wear only on Shabbat-I bought it here during my first week and I think it’s the most beautiful thing I’ve ever seen. It looks like how Shabbat feels. Every Friday night I attend services at Kehilat Zion. It’s a fairly long walk, about 45 minutes, but I enjoy this part of my routine. As I take to the streets, I enter a completely different scene than I did earlier in the day. The streets that were only a few hours ago packed with people and activity are now completely empty. As the sun begins to set, Shabbat begins and the city of Jerusalem drifts off into sleep. I arrive at Zion ready for Shabbat. The weekday feels far away and unimportant as I prepare to enter another world. I walk in and take my seat as the music begins. I imagine that I’m in a cloud drifting higher and higher as the prayer builds and I keep rising up until I’m floating and surrounded by light. This is the only time in the week where I feel truly quiet and still. At the same time, I’m not quiet or still because I’m swaying back and forth and singing. I leave shul and head to dinner with songs in my heart and the faint remnants of my perfume on my skin. I feel like I’m one with this city and I have slipped in to its rhythm. Walking through the streets of Jerusalem at night is a spiritual experience in of itself. After walking down the main roads, I enter the maze of residential streets that connect to mine. As I pass by each home, I listen to the sounds of conversation and prayer that pour out of the windows. There’s something magical about knowing that each house I pass by is a small sanctuary where another family is resting and celebrating Shabbat. I get up early on Saturday morning to attend shul again. I love walking down the street with my tallis bag-it’s my own quiet rebellion. I try to actually rest a bit after I get home in the afternoon, but it’s time for havdalah before I know it. With the lighting of another candle, it’s time for Shabbat to end as the sun sets. Unlike the Shabbat candles on Friday night which are left to burn, the havdalah candle is extinguished forcefully by plunging it into wine. It’s said that the louder the sound this makes, the better your week will be. I don’t know if I believe that, but I do know that as yet another Shabbat slips away and a new week begins, I feel that I am renewed and ready for what the following days may bring. Quiet-like silence, but not really silent.